One beautiful spring day in London, Charlotte, an elderly retired English teacher, is mugged and breaks her hip. This event ricochets off the lives of seven other characters in her orbit, unsettling and rearranging them. While Charlotte convalesces with her likable daughter Rose, and her son-in-law Gerry, she takes the measure of her infirmity. She imagines herself "on the edge of things, clinging on to life's outer rim." Her mischievous insights punctuate the narrative. Charlotte loves books, her "necessary fix". She tutors an adult literacy student, Anton, a recent immigrant, whose introduction to her daughter's household has unintended consequences. Other repercussions from the mugging are a humiliating public speech, a blossoming friendship, a swindle, and a broken marriage. 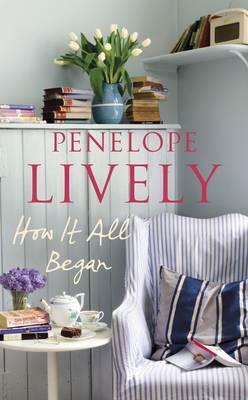 Lively is fond of her characters, and exposes their foibles with a gentle hand. Juggling these separate streams of story, she creates vivid, memorable characters. I avidly read "How It All Began" to see how it all would end for them.